Hello again. A few people found my last post helpful so i decided to do another. This time instead of Helio i have selected Maar’s. 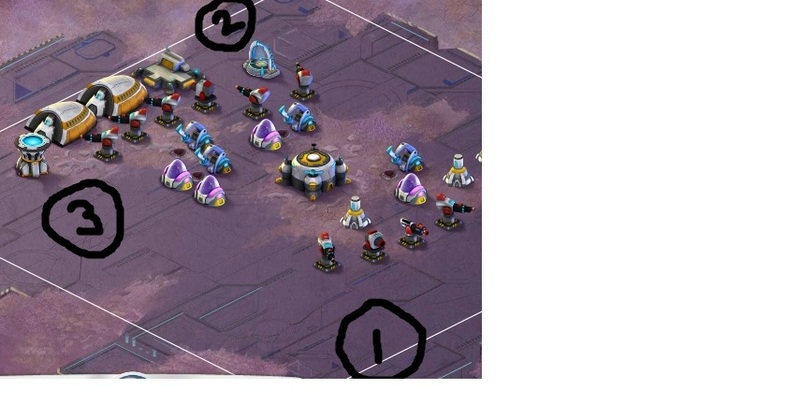 First off the picture in this post is of a lvl 19 however the lvl 25 has the same set up just a couple of extra towers but the drop offs remain the same. ok so.. Drop off 1 as indicated by the numbered circles Here i placed 1 Titan. As soon as the turrets got a fix on the tank i dropped in 7 spectors behind it to take out the entire right side. Drop off 2 As soon as the spectors have taken out the last turret on the right hand side drop another titan where the second numbered circle is in the picture. This takes off the heat from your spent titan as well as taking the concussion turret away from your spectors as they advance to the other towers. Drop Off 3As soon as you have placed your titan in drop off 2 and the turrets are firing place as many pyros as you can fit in drop off 3. The pyros come up behind the towers while your fresh titan takes the pain and begins eliminating from the bottom up. By this time your spectors and 1st titan should join your 2nd titan at the top of the towers and from there everything should be lvld. Again please comment on this strategy, if you found it useful or not, or if you used any different units or have a better way to do the same faction lvl. Hope it helps i will maybe start on the Erazi one too but like i said i am getting on in level so my experiences with these factions might differ if yourr substantially lower in level.